Embarking on a new home building project can be both a thrilling and intimidating experience. This is particularly true when you first start out and lack a set of home construction plans and a home building checklist. By completing these two very important milestones early on, you can remove much of the uncertainly and questions that arise when initially deciding upon a new home building project. For most folks, the concept of needing a set of home construction plans is not un-foreign. However for many, the idea of a home building checklist is. A home building checklist, however, is an incredibly important part of a successful home building project. 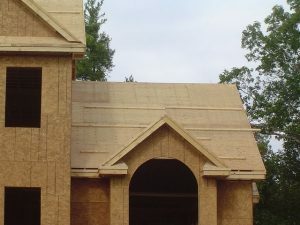 In its crudest form, a home building checklist is a summary list of tasks that need to be performed to successfully build a home or home addition. It is effectively a tool or map that guides you through the home building process. More specifically a home building checklist is a sequential set of steps that includes everything from creating a set of house plans to obtaining the final occupancy permit. You can begin to create your own home building checklist by first writing down all of the questions you have about your new home construction project. By generating a list of your questions you can then begin to build a sequential list of steps that are necessary for ensuring a successful home building project. To help you get started in planning your home building project, I have summarized below a high level home building checklist. Keep in mind however, depending upon your specific home construction project the number and types of steps necessary in your home building checklist may vary. The summary home building checklist I outline below should get you started, but at some point you will probably need to go much further in developing your own new home building plans and schedule. Unless you are planning to pay cash for your home building project, you will need financing. Without financing or cash, you won’t make much progress in your new home building project. Find out what banks will loan you money, how much, and with what terms and conditions. You will need a complete set of home building plans that include the structural detail to obtain building permits. Meet with an architect to find a set of existing home building plans or to design your own custom home building plans. You will need a home building lot to construct your new home. Keep in mind that not all building lots are appropriate for every type of home building plan, so do not purchase your land in a vacuum. Have your building plans handy when evaluating building lots. Also, make sure the land is zoned for residential building. Once you have a complete set of home building plans, meet with potential home building contractors to go over you’re your plans and to obtain construction bids. Carefully review each home building contractor bid to determine which contractor is right for your new home building project. Once you have selected a home building contractor and have accurate home construction cost estimates, obtain financing on the project. With a contractor and financing in place, visit your local building inspector, with your home building plans in tote, to obtain construction permits. With financing and building permits in hand, and a contractor lined up, you are ready to break ground and begin your new home building project. Start and completion dates for your home building project should have been included in the timeline provided by your home building contractor. 8) Visit Construction Site OftenDuring the home building phase, it is important to visit the site often to make sure the construction is going to plan. You may want to consider soliciting the services of your architect to help in this process, as he has the knowledge and experience to ensure your house is constructed to your home building plans. With the completion of each major milestone of your home’s construction, the building inspector should be contacted to come out, and inspect and sign off on the work. Make sure the home building contractor or yourself contact the building inspector ahead of time to make sure the inspector is on-site as soon as the particular milestone is complete. Many days can be wasted on a construction site by waiting around for an inspector to show up. When the construction is complete, it is usually necessary to obtain a final occupancy permit. The occupancy permit, provided by the building inspector, authorizes you to move into the home. Unfortunately it also lets the tax assessor know that it is time to tax you more. With the home ready to move in, contact your bank to convert your home construction loan over to a conventional mortgage. This may involve a closing with the home building contractor, depending upon your business arrangement with him. With a home occupancy permit and mortgage papers in hand, you are now ready to move into your new home. To conclude, it is important to understand that this is a summary outline of a home building checklist. There are many other detailed steps along the way that should be fleshed out when creating your own detailed home building checklist. In addition, each home building project is unique, and as a result your home building checklist may need to include additional items not mentioned in this summary home building checklist. For example, if the new home building project will require a private septic system, you will also need to have a septic design created and approved by the state and local agencies. 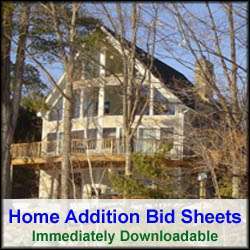 For a more comprehensive new home building checklist, see my New Home Construction Bid Sheet. The New Home Construction Bid Sheet provides a request for quote checklist section that you can provide to prospective building contractors. It also includes a comprehensive new home construction cost breakdown table, in Microsoft Excel format, that allows the contractor to include his projected new home construction costs for every phase of the project.